I've mentioned a couple of times that I had some more pictures of Christmas cards, and finally I am getting around to uploading them!! This card was inspired by something I saw over on Hero Arts. I bought a five pack of Christmas stamps and this is using just one of them.Of all the cards I made this Christmas, this was one of my favourites. These three were once again inspired by the same set of stamps that I bought and an idea I saw over on the Hero Arts website. I much prefer the bottom two. This was actually the first card I ever made. It was made at a Crafty Kidz workshop so it was really just following the instructions we were given! 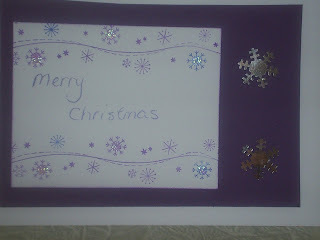 This one was one that my sister's mother in law learnt at a Crafty Kidz workshop and then tried to impart to me!! It looks really effective, but let me tell you that trying to get the pieces back into the triangle shap after they had been cut up was very tricky! These are actually both the same cards. 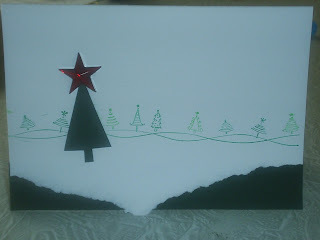 I really liked the way that the stippling thought the punched out stars left the shapes on the inside of the cards. I wasn't overly happy with the middle line of the card....never mind! So there you have it!! At least I made some cards!